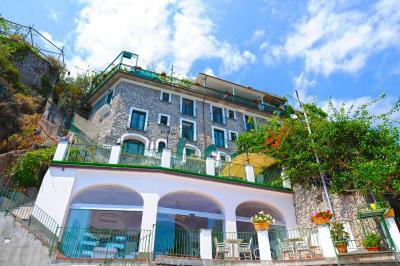 Lock in a great price for Hotel Villa Maria Pia – rated 9.2 by recent guests! Friendly helpful staff who parked our car when we couldn't make it fit. Short walk down the stairs to a great lookout and 15 minute walk to town who were also amazing. Location is a little away from the center of Praiano, which was quiet and peaceful. The property location on the water was awesome, with steps down the cliff to the water yet a good view from the room. Great location with easy access to water and beach. From time of booking until the end of our stay, the staff was extremely informative and helpful arranging transportation, making reservations, etc. I’m very happy with this hotel not only all the rooms have a sea view, the staff are absolutely fantastic. They provided all necessary things to make our stay pleasant from arranging transportation for each trip to providing local tips. 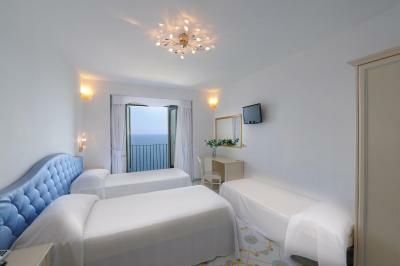 Clean rooms and bathrooms, amazing view.. nice staff, and very comfortable! Wonderful view. Both sky and sea. Staff will help you to organize travel personally. It is really helpful to us. The location of this hotel and the view from our room could not have been better! 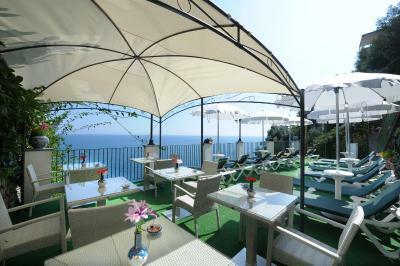 Fantastic breakfast and cappuccino enjoyed each morning on the restaurant terrace overlooking the sea. Quick walk down to the public beach. A little more challenging walking back up, as to be expected. Friendly hotel staff with helpful recommendations for local restaurants. Wished we could have stayed longer! Hotel Villa Maria Pia This rating is a reflection of how the property compares to the industry standard when it comes to price, facilities and services available. It's based on a self-evaluation by the property. Use this rating to help choose your stay! 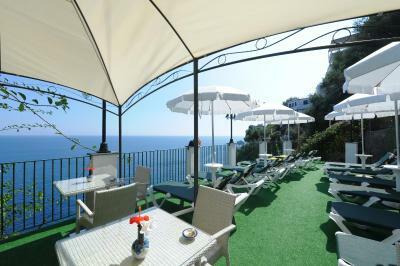 One of our top picks in Praiano.Villa Maria Pia has a cliff-top location and a terrace with panoramic views of the Amalfi Coast. 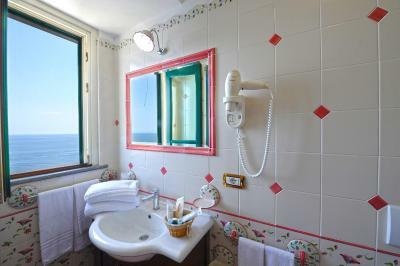 It features rooms with sea views and satellite TV. 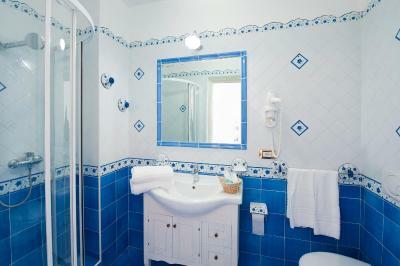 Rooms are decorated in a traditional Mediterranean style and have Vietri tile bathrooms. All include a minibar. 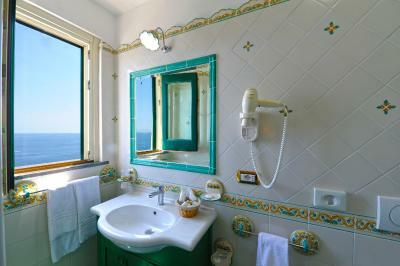 Villa Maria is in Praiano and has private access to the sea by 150 steps. The nearest public beach is 600 feet away. The staff can inform guests about trips to the Suppraiano Caves and other tourist sites including Mount Vesuvius and historic Pompeii. The staff can organize boat trips and book shuttle services and boats for local restaurants and beaches. 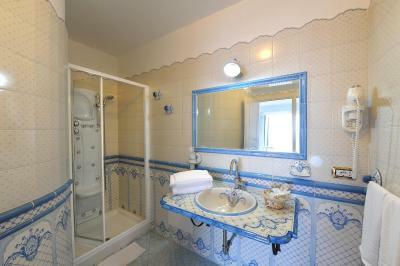 When would you like to stay at Hotel Villa Maria Pia? Large suite with a flat-screen TV, sitting area, bathrobe and slippers and a spa tub. With a bathrobe and hydro-massage shower or bath. 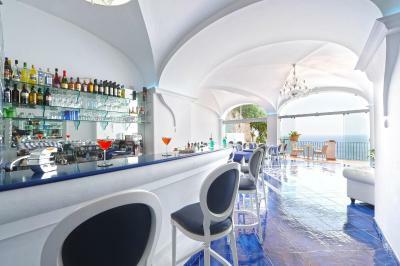 Overlooks the Mediterranean Sea. 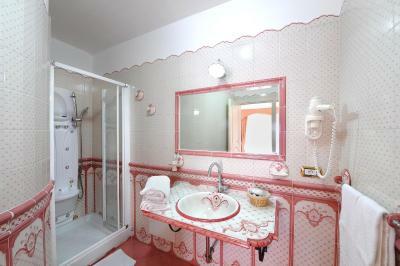 Large room with a flat-screen TV, bathrobe and slippers, balcony and a hydro-massage bathtub or shower. Overlooks the Mediterranean Sea. 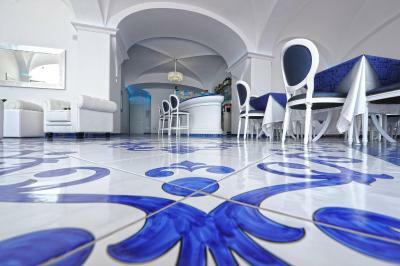 This apartment has a satellite TV, tile/marble floor and air conditioning. 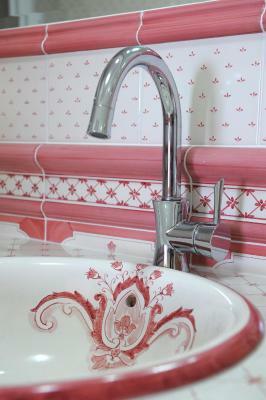 House Rules Hotel Villa Maria Pia takes special requests – add in the next step! Hotel Villa Maria Pia accepts these cards and reserves the right to temporarily hold an amount prior to arrival. Please inform the hotel if you will be arriving outside of normal check-in hours. The hotel's private access to the sea has no beach area. Please note that the property requires a credit card pre-authorization. having to pay for onsite parking. No bar, poor dinner menu. Room a little out of date but it is a Mediterranean feel. The view from the apartment was outstanding, the breakfasts were great and enjoyed being able to eat out on the terrace. When the time came to go to town you really need to get a taxi or bus, it's just a bit too far to walk. Travel around the coast is always an experience - no different from Villa Maria Pia, it just requires planning and patience... and the staff is always ready to help! I don't have nothing to say here. 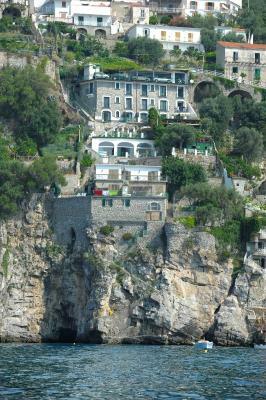 There is a short hike (7-10 minutes) to the beach but that's part of Positano. The beach is quite nice regardless. - The WiFi. When it worked, it was good, but a lot of 10-minute (or more) long drop-outs without any connection. - The lack of wall insulation, meaning that noise from other rooms or reception could be heard. We don't really have any complaints. The location was excellent, the hotel quiet, and the views spectacular. The rooms were comfortable and spotless. The entire hotel staff was extremely helpful and accommodating. Anna, Katia, Julia, Nello and Nincenzo at the front desk helped with all the questions we had, arranging any needed transportation, and offering great suggestions (the boat ride and dinner at Lido Capo di Conca is a must). The staff at the restaurant/lounge area were great as well. Many thanks to Malena, Ada, Elizabettz, and Sandra for making all our meals and evening cocktail hours truly great. It was perfect. We loved our room - extremely clean; beyond expectations. The breakfast buffet was plenty - no complaints! It is a smaller hotel but has all of the luxuries that would be offered at a big hotel. The air conditioning worked wonderfully at night. The rooms were extremely clean and our balcony was amazing! 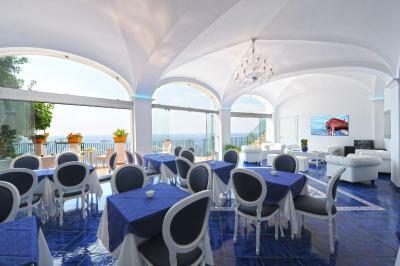 We were between staying in Praiano or staying somewhere else on the Amalfi coast and I am so happy we chose Praiano! We had the best meals of our entire 10 day trip! Villa Maria Staff was more than happy to make recommendations and to help arrange services. We booked a car service to the train station on our own (not through the hotel) because it was less expensive. the morning of our departure, the car service cancelled on us and we were stuck without a ride to the train station. The hotel was amazing and the owner of the hotel Julia quickly arranged for her father in law to drive us (about a 2 hour drive!) 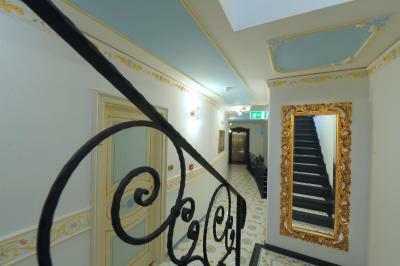 - it was the sweetest and most generous accommodation. I would recommend for everyone to book their excursions through the hotel and any driver services that are needed. They are extremely helpful! The hotel is well located. 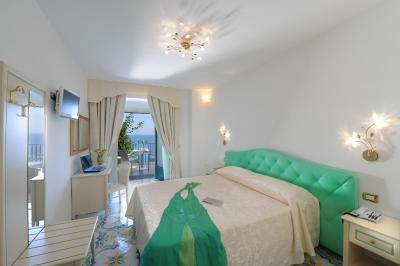 The room was comfortable: The location is perfect to visit the Amalfi coast. The staff is very helpful. The room had an amazing view of Blue sea, some historic building located on the cliff, lovely small boats floating on the sea and interesting billings on the cliff around the hotel. The hotel was very clean, classy, modern and had very friendly and helpful staff. Breakfast terrace had a lovely view too and breakfast was simple but very nice. We had quite enjoyable and relaxing breakfast both mornings we stayed. 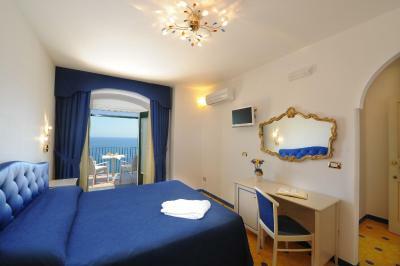 The hotel was very easy to find and easy to visit Positano and Amalffi village with local bus. We loved every moment of our time there and would love to visit again. It’s pretty far away from the town in Praiano. I didn’t get that impression when we read the description about the hotel! 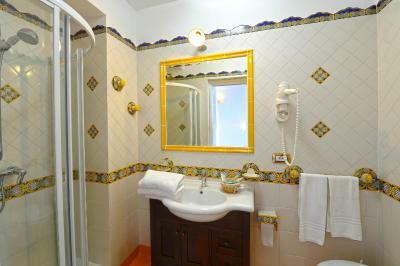 No pool and not being in walking distance to Praiano town and restaurants. Need a car to feel full value and benefit of staying here. The hotel ‘Private beach’ isn’t quite a beach so a bit misleading to have in the description. The hotel staff gives this place top marks! 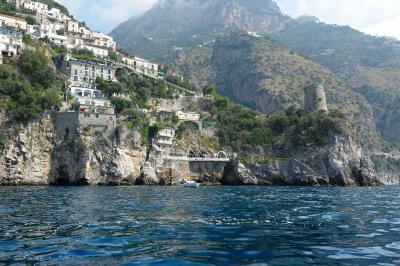 Loved the location and proximity to some great beaches, Positano and Amalfi.